Before the implementation trip, the travel team met in Antigua in time to enjoy some of the Easter parades and festivities and the following day left for Nebaj, the last large town and jump-off point for the rural community of Sumal Grande. Construct a distribution and mixing tank (DT0) with a chlorinator at a location known as JP6, to combine flows from the old and new springs (OS & NS) and allow for proper water disinfection. The driver behind connecting a new spring to the community’s system is anticipated growth in the community in years to come. The flow of water from the spring and the size of the tank should be able to serve the community’s population growth for the next 20 years. Connect the OS to DT0 using an existing unused line from OS to JP0, and by installing additional pipe and fittings to connect from JP0 to DT0. Install pipe and fittings to connect from DT0 to the UTH area. The float valves at tanks DT2, DT3, and DT4 ended up needing to be replaced with new, higher quality 1.5” Helbert float valves. This solved problems of lack of water in certain areas of the system. Over the course of our visit we watched as the new DT0 grew from just rebar to a fully built tank with chlorinator and storage area. A progression of photos is shown below. During our visit in Sumal Grande we learned that there were problems with the system not providing water to many houses in the community, often beginning in the late morning. Upon investigation we discovered a broken float valve in the system’s most downhill tank, which allowed water to run freely out of the overflow pipe. This problem was solved by replacing the broken float valve with a higher quality float valve that is expected to be able to handle the strong water flow. Upon surveying the system, we found that the chlorinator on Tank 3 was functional but no chlorine could be detected by our chlorine tests. Additionally, we collected water samples from the springs as well as from each of the tanks and performed tests for nitrate, nitrite, pH, turbidity, phosphate, manganese, iron, calcium, and E. coli. All water test results were very good and well within any WHO standards. Unfortunately, all E. coli tests were inconclusive. We believe this to be a problem with the testing equipment and plan to research other methods of testing for E. coli in the field for future trips. Using an Abney level, we surveyed the new line from DT0 to where it connected to the rest of the system (JP0) to obtain elevation data after the community members dug the trench and installed the pipes. Installation of pipes in the trenches. Tiffany and Jeff surveying with the Abney level. On our last day in Sumal Grande, the town held a large meeting and lunch with all community members invited to attend. 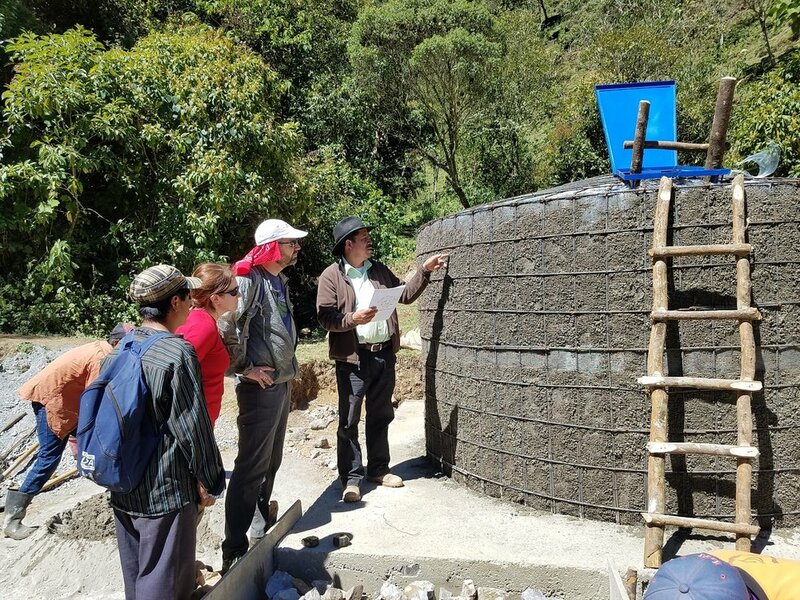 Diego and the mayor of Sumal Grande spoke about the improvements in the water system and the important role it plays in the community, as well as how every community member is responsible for doing their part to keep it operating correctly now and into the future. The event was very well attended by community members and showed us that people were supportive of our work and the improvements in their water distribution system.